Posted March 20th, 2015 by themotochanneladmin & filed under Cafe Racers. 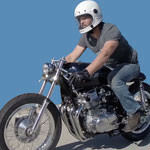 Dustin Kott of Kott Motorcycles near Los Angeles, California shows us his latest build, a custom cafe racer based on a 1974 Honda CB750. Posted January 19th, 2015 by themotochanneladmin & filed under Custom Motorcycles. 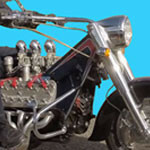 Nick DiBenedetto of Huntington Beach, California shows us his garage built Ford flathead V8 powered Harley-Davidson. Posted January 5th, 2015 by themotochanneladmin & filed under Custom Motorcycles. 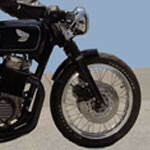 David Miezal of Olympia Motorcycles in Pasadena, California shows us his first build, a custom Moto Guzzi 850T that was inspired by the speed record setting bikes of Ernst Jakob Henne. Posted December 3rd, 2014 by themotochanneladmin & filed under Custom Motorcycles. Way before Polaris began marketing its Slingshot, Sithirak Yin of Eastvale, California built a three-wheeler in his garage which he designed on a computer and based on a Suzuki SV1000 and Hayabusa. BMW and Chevy Corvette car parts were also utilized. Posted November 13th, 2014 by themotochanneladmin & filed under Custom Motorcycles. 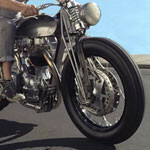 Max Hazan of Hazan Motorworks in Los Angeles, California shows us his custom Royal Enfield Bullet 500. Posted November 13th, 2014 by themotochanneladmin & filed under Choppers. Caleb Owens of Cro Customs near Los Angeles, California shows us his custom build named Uncle Sam that he built for the Born Free 6 show in 2014, which is based on a 1966 Harley-Davidson Shovelhead Electra Glide FLH. Posted July 30th, 2014 by themotochanneladmin & filed under Cafe Racers. 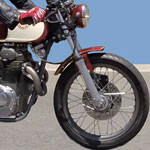 Neil Ferrier of Orange County, California shows us his heavily customized and beautifully restored 1969 Honda SL350 which he built in the cafe racer style in his home garage over a one year period. Posted July 4th, 2014 by themotochanneladmin & filed under Cafe Racers. Don Leonhardt of Long Beach, California shows us his immaculately restored 1977 Honda CB750, which was styled as a resto mod cafe racer. Posted June 16th, 2014 by themotochanneladmin & filed under Vintage Motorcycles. 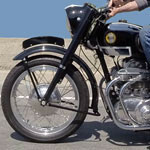 Larry Horn of Huntington Beach, California shows us his 1957 Ariel Square Four MKII, which he restored himself. Posted June 2nd, 2014 by themotochanneladmin & filed under Cafe Racers. 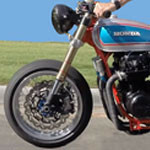 Gerald Prendergast of Cypress, California shows us his custom cafe racer (with a bit of flat tracker added) that he built in his garage from a 1975 Honda CB550.